Candidate for Donna Mayor Ernesto Lugo Jr. poses on the Lott Road property in question Thursday Oct. 18, 2017 in Donna. The Donna city secretary on Friday evening contacted the Hidalgo County Elections Department to bar mayoral candidate Ernesto Lugo Jr. from being able to vote in city elections — just three days before the start of early voting. City Secretary Laura Balderrama wanted the county to modify the city boundaries map she had approved two months prior, which at that time showed Lugo living inside city limits. This comes on the heels of the city’s decision on Oct. 12 to declare Lugo “administratively” ineligible to be mayor because he did not live within city limits, according to a letter he received from Balderrama. Balderrama’s move leaves Lugo unable to vote in the city election. 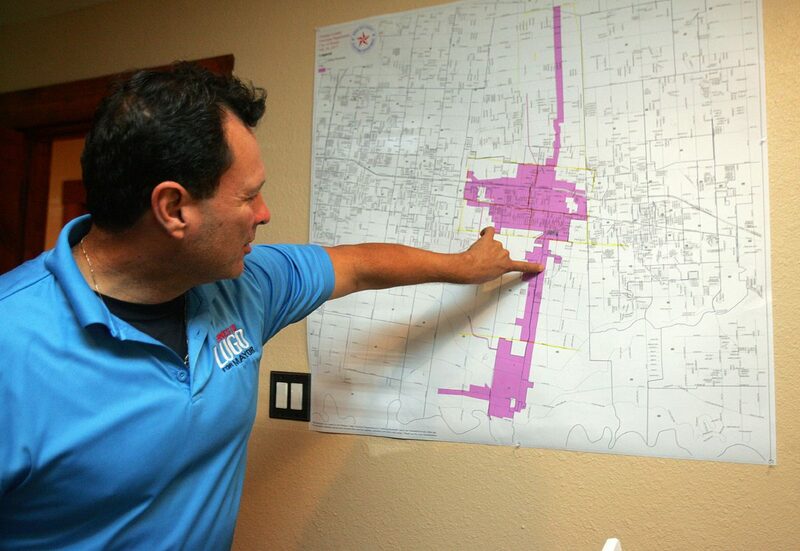 Former Donna mayoral candidate Ernesto Lugo Jr. points to a place on a Hidalgo County Elections Department map where he says his residence lies, within the city of Donna, inside the shaded area, at the Lott Road property in question on Thursday, Oct. 18, 2017. Lugo is in second after early voting to Rick Morales. The question of Lugo’s eligibility first arose when Donna resident Jose H. Garza filed a complaint Oct. 11, nearly three months after Lugo filed for a place on the ballot. Garza did not return calls for comment, and the person who answered the door at his home last week said he was busy mowing the lawn. The complaint questioned whether Lugo’s permanent residence at 2115 Lott Road was in Donna. Anyone who files for candidacy must reside within city limits for at least six months preceding an election, according to the city charter. It was not Lugo, however, but his mother and father, Araceli Lugo and Jose E. Lugo, who signed a development agreement in December 2016. Many cities on the Texas-Mexico border — like Donna — have 5 miles of extraterritorial jurisdiction (ETJ) located outside of city limits and within county jurisdiction. Donna City Manager Ernesto Silva said the Lugo property “has never been in the city” but instead within the city’s ETJ, thus making Lugo ineligible to vote and become mayor. Contrary to Silva’s statement, Hidalgo County Appraisal District records show the city annexed “approximately half” of the Lott Road property in 2013, according to Chief Appraiser Rolando Garza. “The house would be located on the part that would be inside the city,” Garza said of the annexation ordinance. A 2016 map located in the county’s planning department reflects Garza’s statement, as did the Hidalgo County Elections Department’s map — at least as of Wednesday. Lugo said he voted in the 2015 City of Donna election. Cities are responsible for communicating boundary changes — like annexations and de-annexations — to the elections department within 30 days, according to the Texas Elections Code. Once cities inform the department of boundary line changes, the county then updates its voter list and map. But city officials waited 10 months, until Oct. 20, to reach the elections department regarding the Lott Road property’s disputed jurisdiction, as shown in emails obtained by The Monitor. “My GIS (Geographic Information Systems) Department goes ahead and draws up the map, and then we have (cities) approve the map,” Hidalgo County Elections Administrator Yvonne Ramon said of the process in which the county and cities work together. A map approved by city officials in August included the Lugo property inside city limits, Ramon said. Ramon said although she received an email notifying the department that Lugo was deemed ineligible by the city, she had received no notification that this area was de-annexed. Donna city officials have repeatedly cited the development agreement to explain Lugo’s ineligibility to both vote and run for mayor, claiming the document immunes the Lott Road property from annexation for 15 years. City Attorney Eddy Treviño said Lugo was not living within the city limits at the time he filed for a place on the ballot. But Lugo remains adamant in his belief that the Lott Road home is in Donna. When the city began annexing property in 2016, the Lugos signed a development agreement, Lugo said, because they wanted other property, not including the Lott Road home, to remain outside city limits. This would exempt that property from city taxes. 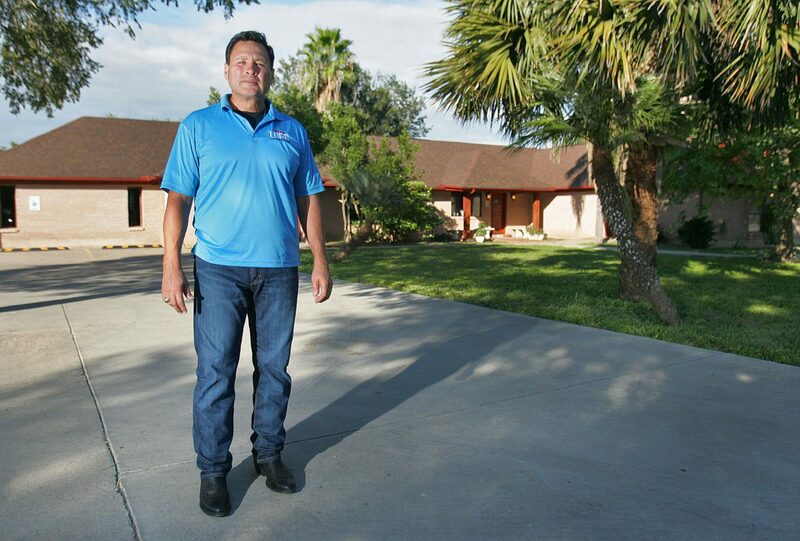 The Lugos own more than a dozen properties throughout Hidalgo County, according to appraisal district records. McAllen-based real estate attorney John King, commenting solely on law, not the election, said development agreements are signed when property owners want their undeveloped property to be immune from annexation for a specified period of time. If the property were to be developed, the city could annex the property, increasing the city’s tax base. A search of appraisal district records show a 2,082-square-foot commercial office on the Lott Road property built in 1974, along with a residential canopy built in 2007. The 2018 appraised value of the property is $179,480, according to the appraisal district’s website. If the city did in fact annex the property — as the county maintains — the property would have to be de-annexed before a development agreement could be signed, King said. “You’d have to have another, or different, agreement saying, ‘City you annexed me, we don’t want that. Would you please de-annex us if we agree?’” King explained. The development agreement signed by the Lugos on Dec. 22, 2016 includes an Exhibit “A” — an attachment that specifies which property is affected by the agreement. However, Exhibit “A” of the development agreement filed by the City of Donna in the Hidalgo County Clerk’s Office shows a printed date of Jan. 17, 2017 — nearly a month after the Lugos signed the agreement. The city manager then signed the agreement on Feb. 13, 2017. Exhibits are not typically signed as part of the development agreement process. Lugo has maintained that the family has another Exhibit “A” that differs from what was filed on record. He chose not to release the exhibit citing the advice of his attorney. “You’ve got a he said, she said,” King said. Law requires a document be accepted at face value, unless it’s reversed by a court. “I think you could certainly make the argument that, as you’ve already pointed out, since the legal (development agreement) was signed on Dec. 22, that this legal (attachment, Exhibit “A”) couldn’t have possibly been on it at that time,” King said. Fraud in the execution happens when a party files a document that includes terms not originally agreed upon at the time of signing. The city’s document stands as filed in the clerk’s office, unless the Lugos file a lawsuit and receive a judgment in their favor. “In this case, the obvious attachment of the exhibit after the Lugos’ signature could be something the court would grant on that,” King said. “People can vote for him,” Treviño said of Lugo, whose name will remain on the ballot. With four candidates in the mayoral race — including incumbent Irene Muñoz, Simon Sauceda and Rick Morales — a runoff is likely. Lugo maintains the declaration of ineligibility was “an effort to manipulate the outcome” of the election. Should Lugo make the runoff or win outright, the issue could head to a district court for a resolution. Residency seems to be the most common issues arising during elections, said former Secretary of State Carlos Cascos. Buck Wood, a prominent election law attorney based in Austin, who is not involved in this particular case, explained residency is “extremely difficult” to determine. “He either lives in the city of Donna or he doesn’t, and that can’t be changed by some development agreement,” Wood said. Treviño said he contacted the Texas Secretary of State’s Office about Lugo’s eligibility, but the state agency’s spokesperson, Sam Taylor, said the city was solely provided with general information about Texas Election Code. The agency itself does not determine a candidate’s eligibly. >> Aug. 27, 2013: Part of Lugo property at 2115 Lott Road annexed by city, according to Hidalgo County Chief Appraiser. >> Dec. 22, 2016: Mother and Father of Ernesto Lugo, Jr. sign development agreement. >> Feb. 17, 2017: Donna city manager signs development agreement. >> Aug. 3, 2017: Lugo applies for a place on the ballot for mayor. >> Oct. 11, 2017: Donna received complaint from citizen regarding Lugo’s residence. >> Oct. 18, 2017: Hidalgo County Elections Administrator says Lugo’s home is within city limits per annexation. >> Oct 20, 2017: Hidalgo County Elections Department map signed off by city official, removing Lugo residence from within city limit boundaries. >> Oct. 20, 2017: Hidalgo County Elections Department map updated per city’s request.